The bill was signed into law in December 2010 and subsequently took effect as the Commercial Advertisement Loudness Mitigation Act. Anna Eshoo later declared this to be one of the most popular pieces of legislation she had sponsored during her entire 18 years in Congress. Equivalents are now applied by Broadcasters in almost every major country, notably in the form of the International Telecommunications Union Recommendation BS.1770 on loudness measurement: 'Algorithms to measure audio programme loudness and true-peak audio level'. The safest places to perform audio loudness control are during programme editing and playout. For editing applications, Eyeheight developed a software Plug-In for Apple Final Cut which is widely used by Broadcast Content Producers. This Plug-In provides automatic control of perceptual loudness and true-peak using ITU-R BS.1770 multi-channel loudness and true-peak estimation algorithms, EBU R128 gating (optional) and proprietary correction algorithms to ensure compliance with ATSC A/85, EBU R128 and short-term peak loudness and peak-program level requirements. Our Plug-In continuously monitors embedded stereo or multi-channel surround audio loudness and seamlessly adjusts system gain across all channels to maximise impact while achieving the target loudness and preserving the spatial imaging. It performs 8x over-sampling true-peak estimation and instantaneous correction to all stereo or multi-channel surround channels to ensure per channel peak-program level limits are adhered to. Figure 1A shows the short-term perceptual loudness (using ITU-R BS.1770) of two interstitials levelled using a traditional peak-programme level measurement of PPM6. It can be clearly seen that the first interstitial has substantially higher perceptual loudness and far exceeds the defined perceptual loudness limit of 0 Loudness Units (in this case -18 Loudness Units relative to Full Scale, or LUFS). The second interstitial is below the loudness limit and is not taking full advantage of the loudness allowance. By contrast the loudness history in Figure 1B shows the short-term perceptual loudness (using ITU-R BS.1770) of the same two interstitials once they have been individually processed using in short-term peak loudness mode. The first commercial now conforms to the 0 LU loudness limit and all dynamics have been maintained. The second commercial now makes full use of the available loudness allowance and will have greater presence. 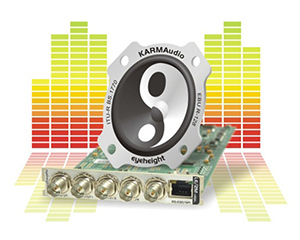 As a result of processing by the Eyeheight KARMAudioAU audio compliance Plug-In, failures are eliminated and maximum use of the available loudness allowance is assured. Figure 2A shows the short-term perceptual loudness (using ITU-R BS.1770) of two interstitials leveled using a traditional peak-program level measurement of PPM6. Despite both hitting PPM6, it can clearly be seen that the first interstitial has substantially higher perceptual loudness than the second. The first exceeds the defined average perceptual loudness limit of - 24LUFS while the second is not taking full advantage of the loudness allowance. By contrast Figure 2B shows the short-term perceptual loudness (using ITU-R BS.1770) of the same two adverts once they have been individually processed using KARMAudioAU in ITU-R BS.1770 (ATSC A/85) loudness mode. Both interstitials now comply with the -24 LUFS average loudness while ensuring that full advantage is taken of the available loudness allowance. As a result of the processing audio compliance failures are eliminated and maximum use of the available loudness allowance is assured. Finally the same audio compliance features are incorporated in the real-time LE-2M-K video and audio legaliser which is designed for Broadcast presentation and playout where a hardware processor is often preferred. Embedded stereo or surround audio loudness are continuously monitored, system gain being seamlessly adjusted across all channels to stay within the loudness limit while preserving audio imaging. Eyeheight Ltd (www.eyeheight.com) was founded in 1992 by Martin Moore and Steve Crocker, BBC-trained engineers who were then working as London-based chief engineers in the post-production industry.